Remember the shoddy toys you begged your parents to buy while waiting in the supermarket checkout line, then promptly lost interest in before the day’s end? Those cheap plastic knock-offs have mostly been ignored by collectors, too, consigned to the dustbins of history almost immediately after purchase. Heiler recently gave Collectors Weekly the scoop on his obsession with junky, off-brand toys. Collectors Weekly: How do you define a rack toy? Heiler: A rack toy is a fun toy that broke really easily. They’re impulse items, toys that usually weren’t TV-advertised or sold at toy stores. If they were sold at a place like Toys “R” Us, they were in the front aisle, that kind of gifty aisle. But rack toys were primarily sold through five-and-dimes, pharmacies, or variety stores, all similar to dollar stores today. Their heyday was the 1960s through the early ’90s, but they’re still around. What’s been taken out of the equation is the wild and random nature of their designs. Licensing departments now have these style guides to adhere to, where Batman has to be this certain color, you have to use this certain picture of him, he goes here, etc. There’s uniformity to the brand. If you go back to the ’60s or the ’70s, it was pretty nuts. 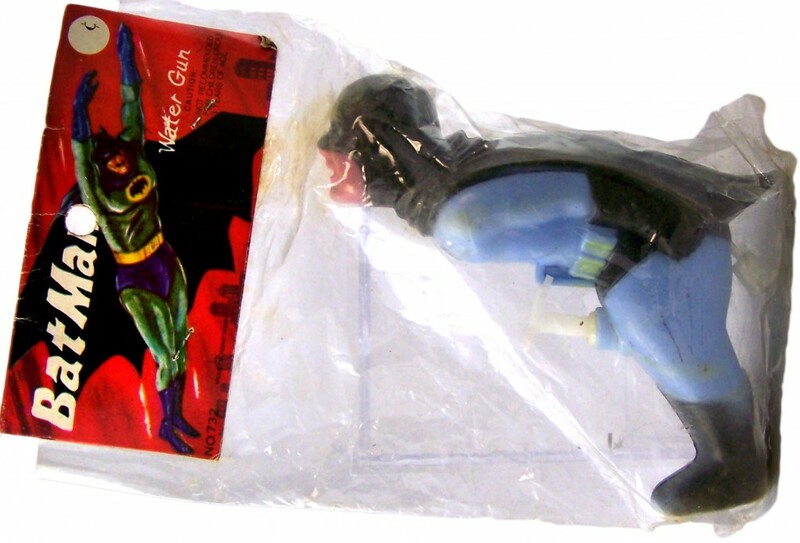 Every package for every Batman toy made by a company like Azrak Hamway was different, just this wild, creative artwork. And that’s the joy of this stuff. It’s really gorgeous. Collectors Weekly: How did you decide to dedicate an entire book to them? 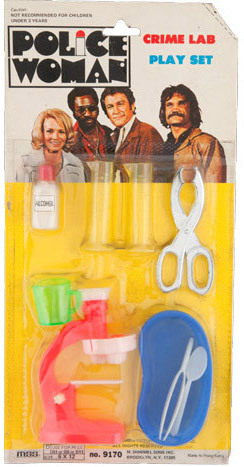 A peculiar crime lab play set was produced in conjunction with the “Police Woman” TV show. Heiler: First of all, my dad was a distributor of rack toys when I was a kid, so I was always around these toys and fascinated by them. I still have big piles of receipts for the toys he ordered. Like a lot of kids, I loved “Planet of the Apes” and all the super heroes. There weren’t many licensed toys I didn’t like. But my favorite rack toys from memory were a line called the Lincoln International Monsters, a semi-rip-off of the AHI-licensed monsters. As a kid I went to a distribution warehouse with my dad, and I saw one of these monsters and I said, “Dad, I want that,” and he said, “OK.” But we left without it, and I thought, “Wait, when am I getting the toy?” He explained that he’d already paid for them, meaning he ordered a gross or something to distribute. And when they arrived, that was the coolest moment ever, opening up an entire gross of action figures and going through them. But the inspiration for the book really came a few years ago, when I started hanging out with a guy who was really interested in rack toys, specifically the “Batman” and “Star Trek” products. I initially spun that off on Plaid Stallions as the Plaid Stallions World of Rack Toys, because no one was talking about this type of toy, and it was so neat. It was an untold story. Half of the products were hilarious because they had no correlation to the license whatsoever, and you’d see this stuff at collector’s shows and it’d be only $5. I’ve found items like a “Kojak” boat or a “Planet of the Apes” helicopter or motorcycle. There’s a Superman with a parachute and the Incredible Hulk with a plane, all these crazy, put-their-faces-on-it-to-sell-them items, and they were absolutely, one hundred percent right. Kids bought it, or their parents did. 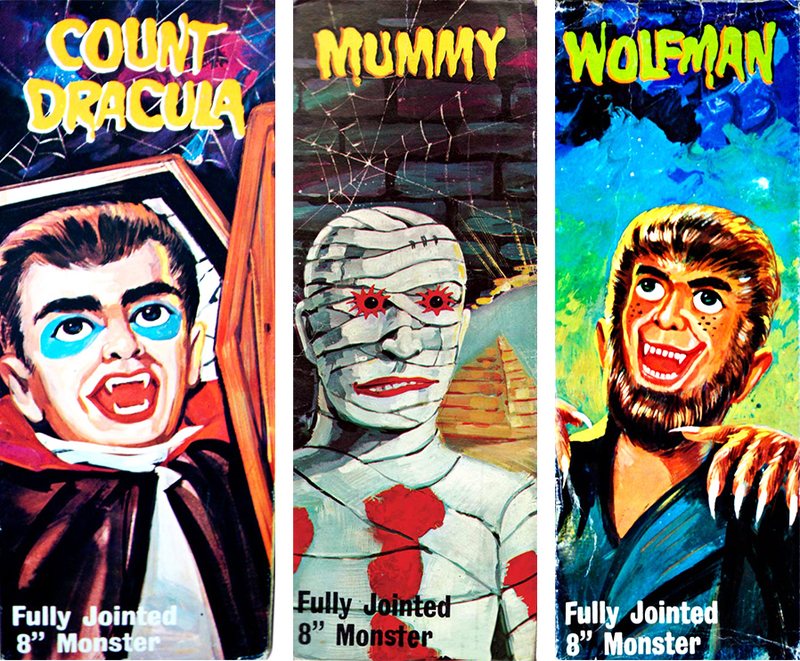 Three box covers for the Lincoln International Monsters, Heiler’s favorite series of rack toys. Collectors Weekly: Were these toys made by recognizable brands? 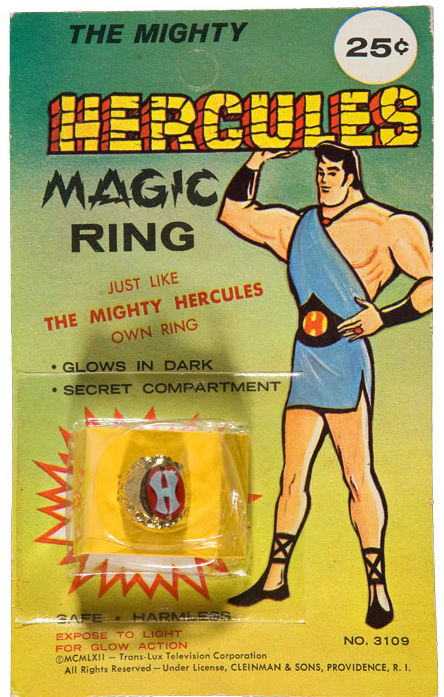 Heiler: I don’t think these companies were well-known like Mego and Mattel and Kenner. They had no TV advertising, and very little to no print advertising. These were brands like Azrak Hamway International, or AHI, which actually bought another company, Remco, in 1974. They would sell higher priced TV-related items under the Remco brand and then all the rack toy stuff under the AHI brand. Larami Toys was another producer in the ’70s, and they were actually owned by a bakery company. So their sales reps would come in with donuts and baked goods, plus these toys to sell at grocery chains. Collectors Weekly: How much did rack toys typically cost? Heiler: They were cheap—a lot of the toys were under a buck. AHI is really famous for making action figures of the Universal monsters, but they weren’t TV advertised. They were meant to look like Mego figures, but they’re a little lower down on the quality scale, and they sold for two bucks. The average super-hero doll went for three. These toys were brought in for a certain price point, and the way to move these low price points was to put some sort of brand recognition on them. 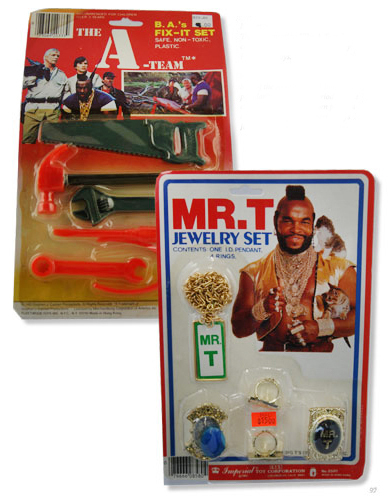 You could sell a plain doctor set, but a “M*A*S*H” doctor set has a little more cachet. 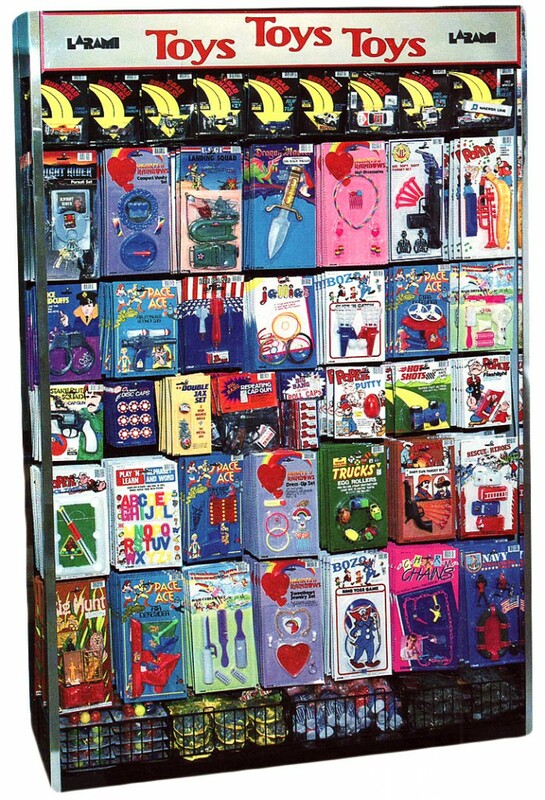 This Larami display rack shows the company’s toys in the wild. Collectors Weekly: Were the majority of these toys action figures? Heiler: No, not at all, actually. They’re based on every toy concept out there: water pistols, archery sets, vehicles, rubber jigglers, bendable figurines. The book has some action figures in it, but it’s not exclusive to them at all; you name it, it’s in there. Collectors Weekly: Were the licenses very specific as to what type of products they could make? Heiler: Yeah. There were points during the ’70s and ’80s where several companies would have the Marvel Comics license, and you can tell who probably had first dibs if they made fighter cars and Spider-Man helicopters. Another company would make the Spider-Man flashlights or ray guns or whistles. You could share the license but they didn’t have three businesses making the same items. Collectors Weekly: Did rack-toy producers have conflicts with more established companies over the licenses? Heiler: Yes. 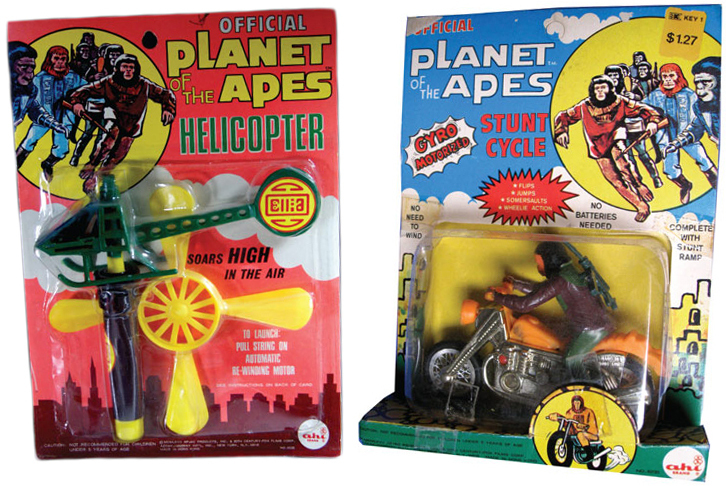 In 1974, AHI had a “Planet of the Apes” license to produce things like the aforementioned helicopters, but they didn’t get the action-figure license. Mego swooped in and got that. And AHI went, “Well, let’s make ape dolls anyway,” and they made these crass versions called “Action Ape Men.” They’re chimpanzees and orangutans in military garb with rifles. Mego was not thrilled, and neither was 20th Century Fox, so the toys were pulled. And they’re quite rare today, especially packaged examples. These AHI “Planet of the Apes” toys were officially licensed, but its knock-off “Action Ape Men” were not. Collectors Weekly: What are some of the more bizarre rack toys you’ve seen? Heiler: One that makes me laugh is when Spider-Woman came out (the Marvel super hero), they used her face to sell jewelry sets, which is very stereotypical and has nothing to do with the character. There’s a “Love Boat” barbershop set, and I’m not sure how that relates to “Love Boat” at all. Maybe I missed an episode. One of the most bizarre items I found was a water pistol in the shape of Adam West as Batman. The squirt trigger is in an inappropriate place, and the place where you put water in is equally inappropriate. He’s actually bending over, and water squirts out of his mouth. And well, you can do the rest of the math. This suggestive Batman squirt-gun is one of Heiler’s favorite finds. There’s also super hero from Japan called Spectreman, and I’ve got a Spectreman toy called a “Bowling Pump.” And it’s just a bowling pin that squirts water. How they tie that into Spectreman, I have no idea. It shows a complete lack of caring for what the licensed series was about. There’s a flashlight from Japan that stymies me. It’s a regular flashlight, but on the card it has James Bond, the Man from U.N.C.L.E., Space Giants, and Gappa on it. Like it’s this amazing, super-movie that you’ve never seen. I think the number one character that gets licensed is Popeye; they put Popeye’s face on everything, from barber sets to train sets, none of it makes a lot of sense. It doesn’t matter. They were producing Popeye toys up until the ’90s. They may still be putting Popeye’s face on rack toys. Collectors Weekly: One of the chapters in your book is called “Generic Joy.” What falls into that category? 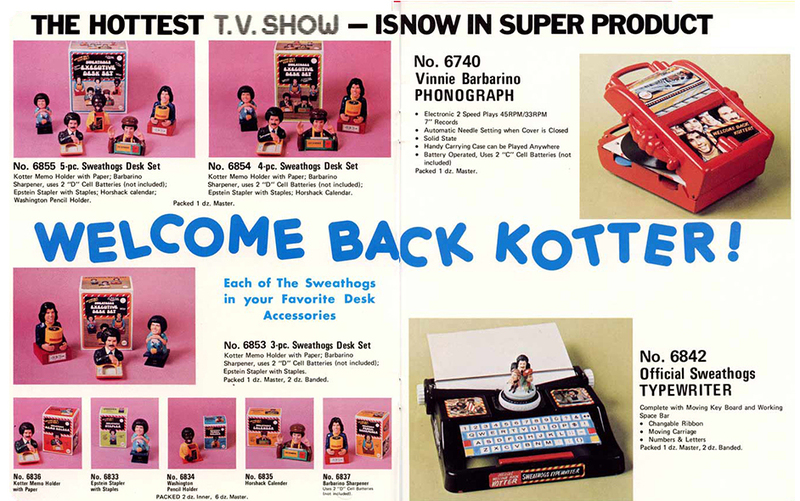 AHI’s license with the “Welcome Back Kotter” TV series was used to promote this odd group of desk accessories in 1977, which included a working record player and typewriter. Collectors Weekly: Are any rack toys interesting from a mechanical perspective? Heiler: For the most part, you’re getting some cheap walkie-talkies that don’t work. But a few are kind of brilliant. AHI made these windup monsters that I just love. You wind them up and the sparks shoot out of their mouth. I love the helicopters, and they actually work really well, though with a lot of these cheap toys, you get exactly what you pay for. For some reason, in 1977 Fleetwood made a figure of Ghost Rider on his bike, and it had swappable heads so you could switch between Johnny Blaze and Ghost Rider. Most kids didn’t know who he was. So that’s pretty crazy attention to detail for such a cheap toy, but they did it. It’s pretty neat. Collectors Weekly: Did you come across any toys that were actually valuable or rare from a collector’s standpoint? Heiler: There’s a Dracula that came out only in the U.K. that’s worth a couple thousand dollars. A lot of the monster toys are quite valuable. The more iconic toys, like the Batmobile, the Batboat, Batman on a motorcycle, the Joker parachuting, those are all worth a couple of hundred bucks apiece. Star Trek toys also sell really well, especially if it’s a Phaser or the Enterprise. 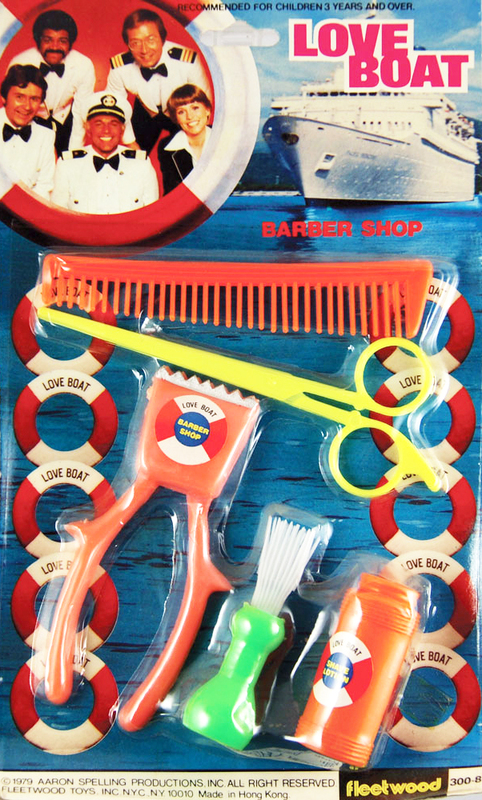 The infamous “Love Boat” barber kit. The one item that eluded me—I got a photo of it, but I really want to own it—was the “Planet of the Apes” prison wagon. It’s got a little figurine of an astronaut stuck in a cage and Dr. Zeus is marching him off somewhere. And it goes for $500 or more on eBay. The “Love Boat” barber shop set sat on eBay for a year, and the guy wanted 25 bucks. I kept thinking, “I want this, but I’m not giving him 25 bucks for it.” Eventually, I think only a month before I finished the book, he had a 25-percent-off sale and I bought it. It was so stupid, but it felt so right for such a weird toy. My small victory. I don’t think there are any specific rack toy collectors, but if you collect toys, chances are you already have some rack toys. Somewhere, something appeals to you. I know a wide network of toy collectors, and I would ask them, “What do you have that you would consider a rack toy?” And it was amazing the items people pulled out. 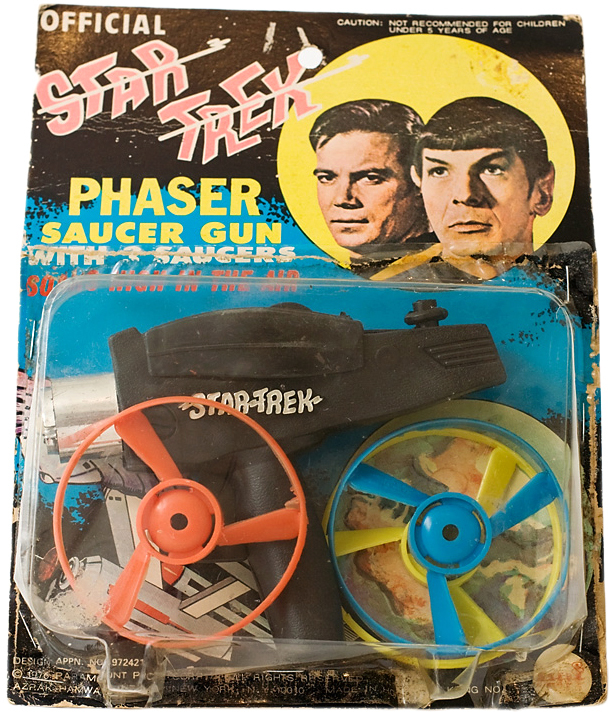 This AHI “Official Star Trek Phaser Saucer Gun” combines the TV show’s recognizable weapon with a common style rack toy. Image via startrek.com. Collectors Weekly: Are all the items in the book from your personal collection? Heiler: I started out with a friend sending me photos of his collection, but in order to get the book done, I ended up spending—I don’t even want to know exactly—thousands of dollars on crap I didn’t need. So I still have the “Love Boat” barber set if anyone would like to purchase it for half of what I paid. I had friends go to toy shows and send me photos from their phones and I’d go, “I want that, I want that.” I would also set up a little light tent at toy shows and ask dealers if I could take photos of their stuff. It all adds up. At one point I had everything hanging on my office walls. And my wife said, “Do you like this?” and I’m like, “Well, it’s part of the process.” And she goes, “You’re starting to look like a junk store,” because I had things like these “Annie” curlers hanging on the wall—just crazy, weird toys all over the place. 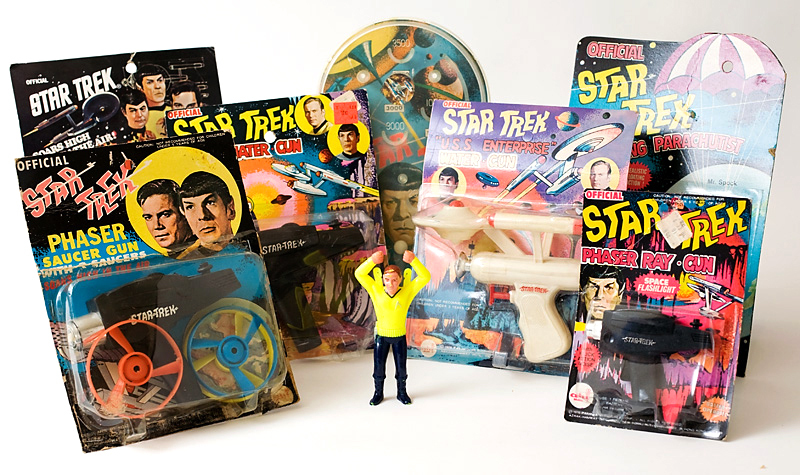 A selection of AHI “Star Trek” rack toys. Image via startrek.com. All images courtesy Brian Heiler, except as indicated. Wow. some of those Star Trek toys were using the logo from the Gold Key/Western comic book spinoff. I wonder if publishing a licensed adaptation gave them rights to authorized further tie-ins to their comics book? I love this! These bring back memories. Now, we have the local variations of the dollar store to stock up on shoddy toys. Kids still love them, and I don’t care if I have to throw away the pieces after an hour. That Batman gun must have been made as a joke. Or at least made as a kind of cross-over toy that would appeal to an adult too. I’d actually buy that… um, I mean, how dreadful! WHERE IS THE CARD BOARD SUB FOR 3.00 DOLLARS FOUND ON THE BACK OF SOME COMIC BOOKS. “ ” In the '60s, I was scorned as a psychedelic artist, especially when seen in the company of Tim Leary.